SAN ANTONIO – The first seven months of the Gardner Minshew era at Washington State have been something to remember. Who was to say the last few days of it wouldn’t? After strolling into San Antonio wearing a retro 1970s disco outfit that was lent to him by a WSU fan wanting to put it to good use, Minshew has made one statement after another in Texas. On Wednesday, at a player news conference held at a Marriott hotel on San Antonio’s famous Riverwalk, the microphone somehow found its way into the hands of a teenage boy. After wrangling the mic, Gavin Spurrier – the son of WSU outside receivers coach Steve Spurrier Jr. – posed his question to Minshew. I’m just curious, how much would someone have to pay you to shave off your mustache? The lush stache WSU’s quarterback began growing in early August outgrew Pullman city limits by the midway point of the season and soon started to grab national attention, as Minshew continued to pile up more passing yards than any quarterback in the country. Hundreds of thousands of Cougar fans – young and old, male and female – participated in the movement, wearing replica stick-on staches to home games this season. The look inspired a wave of youngsters to dress as Minshew for Halloween. And the mustache was plastered on homemade signs when WSU hosted ESPN’s College GameDay show earlier this season, then made a second cameo on national television when the QB taped a stick-on stache to his coach’s lip during a postgame interview in Boulder, Colorado. Later on Wednesday evening, Minshew stole another show just downstream. So now that Minshew’s made statements with his fashion and words, the quarterback hopes to make one more with his prolific right arm. The 12th-ranked Cougars (10-2, 7-2) take on No. 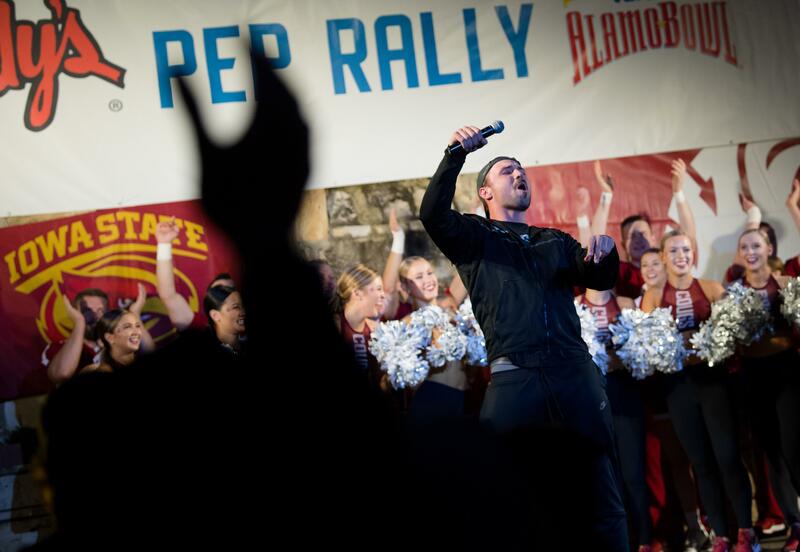 25 Iowa State (8-4, 7-2) Friday in the Valero Alamo Bowl, and a win would signify an indelible ending for a quarterback whose winding road from obscurity to celebrity has been anything but straightforward. It took Minshew four tries to find his dream school and once he got there, the quarterback’s clock started ticking. Seven months after meeting his teammates in Pullman for the first time, Minshew will throw his final passes in a crimson uniform – and in a college football game – when the Cougars march into the Alamodome for Friday’s game against the Cyclones. Time flies, as they say. But Minshew hasn’t spent too much time on that subject yet. Rather, hasn’t had time to. Behind the swanky outfits, backward ball caps and aviator shades is a film hound, a workout junkie and football nut who was so devoted to learning the Air Raid offense in middle school, he’d spend hours in his father’s car, driving 90 miles each way, just to nail down the schemes with his eventual offensive coordinator at Brandon High in Mississippi. Minshew, who thrives on competition, willed his way to winning Washington State’s starting quarterback job despite showing up a few months late to the party. On Wednesday, with his QB stationed on the other side of the hotel ballroom, wide receiver Jamire Calvin was asked to recite his first impression of Minshew. It’s pretty much on par with what every other Cougar player would say if prompted with the same question. Now Minshew, the national leader in passing yards per game, the Pac-12’s Offensive Player of the Year, the Johnny Unitas Golden Arm Award winner who recorded the second-highest Heisman finish in WSU history, will try to author one final chapter of his magnificent story. He’s on track to become the Pac-12’s single-season passing leader in the Alamo Bowl and should easily break the WSU record for the same category, but if he has to talk about his legacy, he’d rather be remembered as the QB who delivered the Cougars their 11th win – which would be a record. One party wouldn’t have been successful without the other – Washington State and Minshew, Minshew and Washington State – and their marriage is something Cougar fans will remember for decades to come. For now, No. 16 has one more show to steal and one more stage to capture. Published: Dec. 27, 2018, 5 a.m.